Precious metals investors, specifically those people who invest in silver bars, are more than aware of the common sizes of bars such as the small one ounce bars and the huge 100 ounce versions. A size of silver bar that more often than not goes unnoticed is the 10 ounce bar simply because many people are unaware of its existence or ability to be purchased. The 10 ounce silver bar is actually a great investment tool as it is a large enough bar to be a decent sized investment in and of itself, while still being small enough and light enough to transport and store just about anywhere. There are a number of different companies who produce the 10 ounce bar so you can expect different prices as you go from brand to brand. As is the case with any other size of bar the brand that it is has a huge bearing on how much it will cost. Because most silver bars of the same size look identical it is hard to believe that brands come into play, but they do and people will only purchase bars made by their favorite brand. 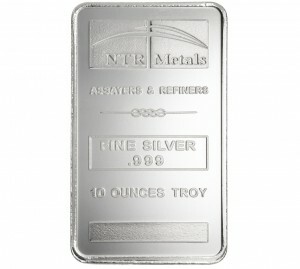 In the following few sections you will understand everything there is to know about 10 ounce silver bars. Like any other size of silver bars, the ten ounce variety are also produced and distributed by a number of different companies. To a lot of folks, the brand name really does not matter because regardless of brand a ten ounce silver bar is a ten ounce silver bar. To others, however, the brand name behind the bar means everything and if a site does not have the company or style they are looking for they will gladly take their services elsewhere. If you do eventually become loyal to any one brand you should be aware that the premiums will change from company to company. Just like a T-shirt produced by a high-end clothing company costs more than a similar T-shirt that was made by a low-end company, certain silver bars will carry with them a higher premium than other types. Your job as a buyer is to see the different brands that exist and choose the one you like the best, or if you do not care about brands, simply choosing the one that costs you the least amount of money. As the weight of the silver bar at hand increases, so too does the actual size of the bar itself. 10 ounce bars are no where near the biggest version of silver bullion, but they are fairly large when compared to something like a 1 ounce bar. Regardless, storing a large quantity of 10 ounce silver bars should not be too difficult or space-consuming for most people. The dimensions of a typical silver bar are roughly 46mm x 90mm x 7.58mm. If you are from America these dimensions are most easily understood by stating them in inches: 2.05″ x 5.13″. Of course with each brand of bar there may be a small variation to the exact dimensions, but you would be hard-pressed to find any widely circulated 10 ounce silver bars who do not have dimensions roughly similar to those that we just mentioned. Like we said before, storing a lot of 10 ounce silver bars shoud not be very difficult because they are not much bigger than a shoe or a television remote. Unless the quantity of bars that you are buying is in the thousands you should have no room finding space in your house. Most people place them in a safe or other container for safekeeping and to keep them all in one place in their house for ease of access. 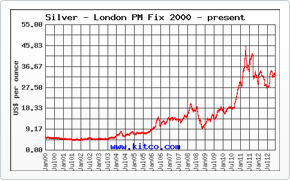 As we get into the 10 and 100 ounce silver bars you may begin to hear talk of investors seeking third party companies to watch over their precious metals investments but unless your collection of bars is absolutely massive, this practice would be more of a waste of money than anything for you. As it goes with just about any other type of precious metal, silver bars carry a premium on them which is the amount of money over the value of the silver that the bar is being sold for. Most often the premium is not too much over $2, but depending on the brand name and the year the bar was minted that number can change quite a bit. Because the premium of the same bar may be different from one dealer to the next it is important that you shop around to be able to compare prices and get the best deal for you. If you do not compare prices between online dealers you will likely end up paying too much for your silver bullion purchase.